It started with four geographically-based groups that played either six or seven rounds of Swiss. The top-8 from each group proceeded to play a double-elimination round of 32 against other players from their group in new groups of four. The top-2 of each of these groups played a double-elimination round of 16 against other players from any group in groups of four. Finally, the top-2 of each of these groups entered a single-elimination bracket for the top-8. 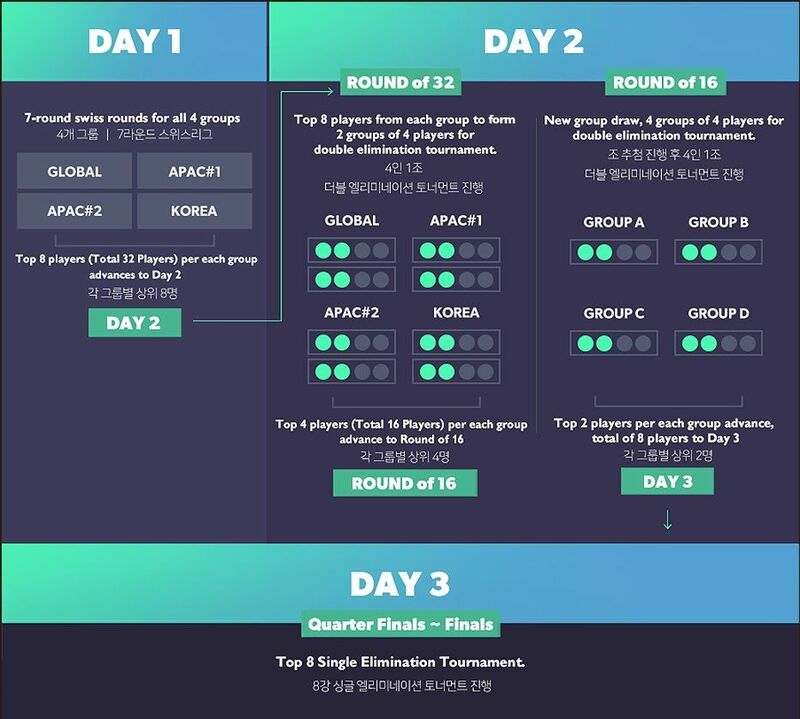 This system meant that the top-16 was guaranteed to consist of 4 global players, 8 APAC players, and 4 Korean players. It is only in top-8 that regions were not guaranteed to have representation. The decklists are available on the bracket site. 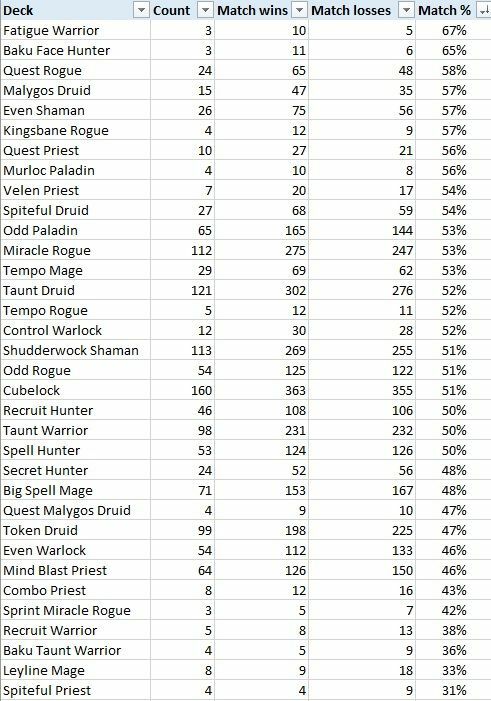 Druid and Warlock remained the two most popular classes overall, but the picture changed when it comes to the top-8: every player who made it that far brought Druid, but only 4 brought Warlock, and both Shaman and Rogue were more common in the top-8 than Warlock. HCT Seoul was in a peculiar spot. The deck submission deadline was extremely early, a full week before the tournament, and therefore the players did not yet know how Dreamhack Austin turned out when they submitted their decks. HCT Seoul meta is a curious mix of some more knowledge than DH Austin, but no real tournament data yet. 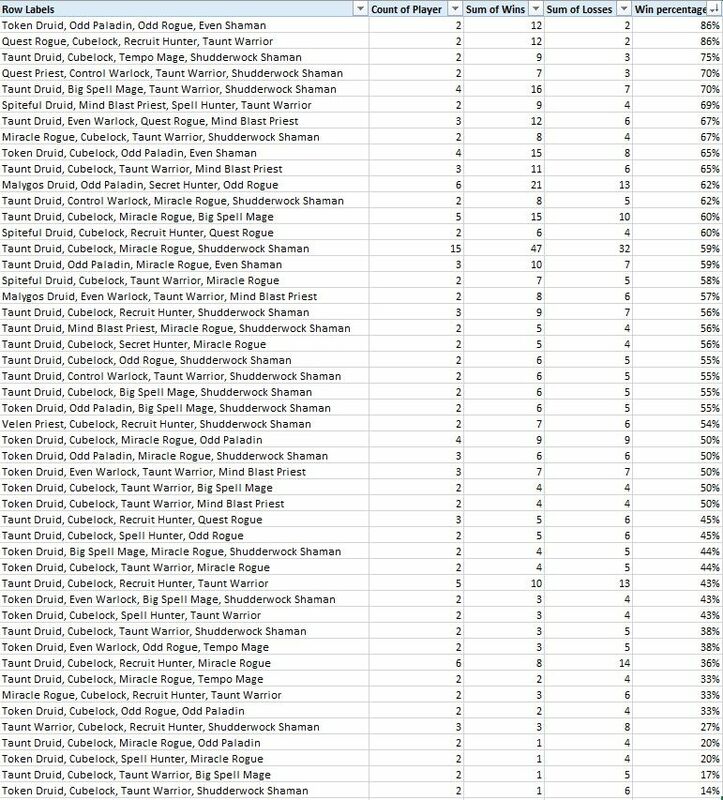 This can be seen in the relatively diverse meta at the tournament: 47 different archetypes and 249 different lineups is a clear indication that players did not have full information about the meta yet. Furthermore, the decks used were partially old-fashioned by the time the tournament was played, as the meta is evolving rapidly still. Druid was the most popular class. There were seven varieties of Druid at the tournament, and three of them made it all the way to the top-8: 121 Taunt Druids (4 in the top-8), 99 Token Druids (3 in the top-8), and 15 Malygos Druids (1 in the top-8). There were also 27 Spiteful Druids, but the best of them only reached the round of 32. The overall Swiss performance of Druid lineups paints a bit of a different picture: Malygos Druid lineups did very well, Spiteful Druid lineups were good, and Taunt Druid lineups were reliable, but Token Druid lineups failed to reach 50% win rate overall. Easily targetable in Conquest format, perhaps? Warlock was the second-most popular class, but can it keep up? Only four of the 229 Warlocks reached the top-8, all of them Cubelocks. There were 160 Cubelocks, 54 Even Warlocks, 12 Control Warlocks, and 2 Zoolocks in the tournament. Looking at overall performance, lineups with Cubelock or Control Warlock in them performed better than average, whereas lineups with Even Warlock in them struggled. Rogue is living the Miracle dream again, and HCT Seoul saw a lot of Miracle Rogues. There were 112 Miracle Rogues (3 in the top-8), 54 Odd Rogues (2 in the top-8), 24 Quest Rogues, and an assortment of four other Rogue archetypes. Rogue shows how difficult it is to analyze a tournament structured as multiple small tournaments like HCT Seoul. Quest Rogue lineups were some of the best-performing lineups in the Swiss, but they excelled in two groups in particular: Korea and APAC#2. Looking at the top-8, there is only one player from those two groups in it. Subtle differences in the meta can make or break a highly polarized deck such as Quest Rogue – it clearly had a great time in certain groups, but not in the final matches. Shaman was the class with the least variety. It’s either Shudderwock or it’s Even. 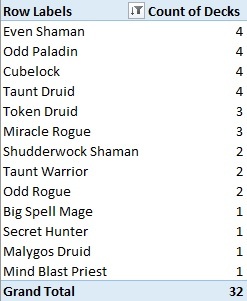 There were 113 Shudderwock Shamans (2 in the top-8) and 26 Even Shamans (4 in the top-8). Yes, that’s right. Shudderwock was the archetype people brought, but Even was the archetype that succeeded better. Shudderwock lineups performed slightly above average, but Even Shaman lineups were at the very top. The rise of Recruit Hunter on the ladder finally showed its first signs in tournament meta at HCT Seoul. There were many varieties of Recruit Hunter in the tournament, clearly there was no agreement as to what works by the time the decks had to be submitted. Consequently, no Recruit Hunters made it to the top-8, but I would not read too much into it yet given the relative immaturity of the decklists. There were 53 Spell Hunters (none in the top-8), 46 Recruit Hunters (none in the top-8), and 24 Secret Hunters (1 in the top-8). In Swiss, none of the Hunter archetypes had a particularly good time, all lineups staying at around 50% win rate with the sole exception of Baku Face Hunter that had two players reach 5-2 in APAC#1 group. Warrior failed to impress. There were 98 Taunt Warriors in the tournament, and two of them reached the top-8 with an overall average performance. The few Baku Taunt Warrior lineups were miserable, as were Recruit Warrior lineups. Fatigue Warrior looked good only because 부계키우는사람#3335 piloted it to 6-1 in Swiss, but he too ended up losing in the round of 32. Big Spell Mage continues to disappoint. 71 players brought it, one reached the top-8, and overall lineups with Big Spell Mage in them were among the worst ones. Tempo Mage lineups did better, but none of the 29 Tempo Mages reached the top-8, the final one bowing out in the round of 16. Priest did not have a lot to brag about at HCT Seoul either. One of the 64 Mind Blast Priests reached the top-8, but overall the deck was in the worst lineups of any popular archetype. Quest Priest (10) and Velen Priest (7) did better overall, but their sample sizes are low. The least popular class at the tournament was Paladin. However, 4 of the 65 Odd Paladins reached the top-8, making it one of the most successful archetypes. There were also four Murloc Paladins in the tournament, and the best of them reached the round of 16, so there is still some life left in the aggressive Paladin archetypes. Looking at the popular archetypes and the success of lineups that included them, Odd Paladin, Miracle Rogue, and Taunt Druid had a good time in the tournament. Shudderwock Shaman, Odd Rogue, Cubelock, and Taunt Warrior did a reasonable job, whereas Big Spell Mage, Token Druid, Even Warlock, and Mind Blast Priest were disappointments. The most popular lineup in the tournament, brought by 15 players, was Taunt Druid – Cubelock – Miracle Rogue – Shudderwock Shaman. It also performed above average and one player piloted it all the way to the top-8.